There must have been an angel watching over Spencer the day he was spotted running lose on a very busy highway. A couple traveling the road stopped their car and spent nearly an hour chasing him over train tracks and through overgrown terrain until they cornered him in a junkyard where they were able to capture him. They found some blood on him and took him to a vet. The vet, after checking Spencer out, turned him into a local shelter. Spencer languished in the shelter which, like most shelters, was overflowing with animals. 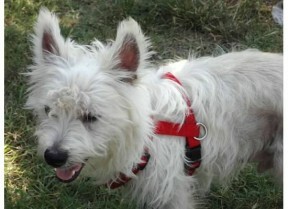 Fortunately for the little Westie, Linda from Westie Rescue of Austin, TX heard about Spencer and brought him into rescue. Working with the shelter, Linda got Spencer neutered and began the process of getting him ready for adoption. Spencer, however, was very puppy-like and would need some training to increase his chances of finding a forever home. Linda heard of a nearby dog training center that needed dogs to work with their interns. The program offered small groups with individual attention; just what the doctor ordered for Spencer. From the first class, Spencer did well. It was as if he was glad to be finally shown what he was supposed to do. In addition, Wanda who was the intern working with Spencer, came to Linda’s home during the week to practice with Spencer. Soon the excitable puppy was learning to walk calmly on a leash and sit patiently. Meanwhile, Linda pursued the applications that came in asking to adopt Spencer. The agreement for any adoption of Spencer was that he would continue in his training class. The first couple to apply was an older couple and Linda took Spencer to meet them. While the husband was eager to adopt Spencer, the wife seemed reluctant. I just felt it wasn’t the right situation for Spencer. Linda politely declined. When a second couple applied, Linda again took Spencer for a visit. Immediately there were a number of red flags. The Jack Russell Terrier already in residence did not take to Spencer and was snippy. The privacy fence was not in good condition and there was a large hole in the cement deck. These were not good signs for a dog like Spencer who had escaped his first home. Linda politely declined this adoption application as well. The third couple who applied for Spencer, was retired and the husband had suffered a stroke which left him slightly handicapped. He told Linda that they had recently lost their elderly Westie and, while as a minister he was used to counseling parishioners on the loss of friends and family, he said losing his Westie was the worst day of his life. Things began to fall into place. The couple was familiar with the training center where Spencer was in class and the wife went to the training center and met with Spencer’s intern. Linda felt confident this was the perfect forever home for Spencer. After the adoption, the couple finished Spencer’s training program and immediately signed him up for additional classes so they could work together. They also arranged for private sessions in their home with Spencer’s intern. Today, Spencer is a treasured family member. He enjoys playing with their daughter’s dog and the couple’s grandchild. Still an impish Westie, he has trained his owners to reward him with a cookie when he runs upstairs and then comes down when called. Spencer’s case is a good illustration of why dedicated breed rescue organizations are so important. 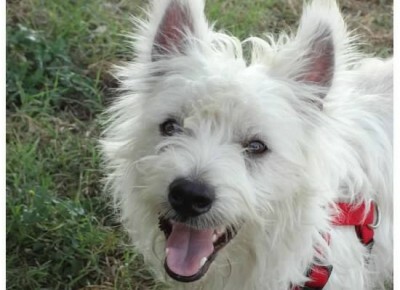 Linda of Westie Rescue of Austin, TX understood what it would take first to get Spencer ready for adoption so he would put his best paw forward, and then what was needed for a successful adoption. In this case, home visits by an experienced rescuer prevented Spencer from being placed somewhere that was a poor fit; somewhere that might have led to his being returned to rescue or worse, dumped in a shelter. By being careful and patient and using her knowledge and experience, Linda found the perfect home for Spencer. Dogs, especially those in rescue waiting to be adopted, depend on humans to advocate for them, to make sure that they are cared for and ultimately placed in an adoption situation that leads to a forever home. It’s a sacred trust. If you would like to learn more about Westie Rescue of Austin, TX, apply to adopt a rescue, or donate to this worthy organization, visit their website. You can find more animal rescue, therapy dog, and other pet related articles in our pet section.